In food processor, add avocado, yogurt, cilantro, red onion, lime juice, salt and pepper. Cover and process until mostly smooth. Spoon dip into serving dish. Top with chopped mango and cilantro. Serve with tortilla chips or fresh cut vegetables, or spoon onto cooked salmon or chicken. Use Yoplait® Greek pineapple yogurt in place of Greek 100 protein mango yogurt, if desired. There are many ways to make guacamole. Some people like cilantro and tomatoes added, others prefer just avocado and a squirt of lemon juice. Some people like their guacamole chunky, others prefer a smoother consistency. Whichever way you prepare your bowl of guac, it’s guaranteed to be a hit. 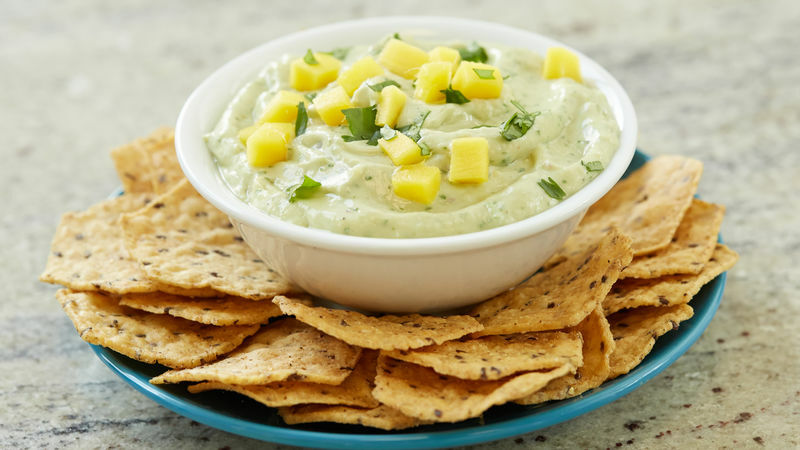 If you’re on the hunt for a creamy dip-like version of guacamole or just want to try something new, look no further than this mango guacamole dip recipe. The secret? Mango Greek yogurt! One container of Greek yogurt will automatically transform your traditional guacamole into a unique dip that’ll surprise and delight your guests at the party (and they will never guess it only took you 10 minutes to throw together). Can’t get enough guacamole? Read our how to make guacamole article for every trick in the book for preparing the perfect bowl of guac, plus even more delicious twists on the classic recipe.